Someone is going to have to explain the flamingo thing to me! I must be too old and too out of touch to understand the trend for flamingo images! I received this Fabulous Flamingo stamp set as a freebie at On Stage. I'm always grateful for freebies so this is my first flamingo! I love the new Berry Burst colour - even on flamingoes! 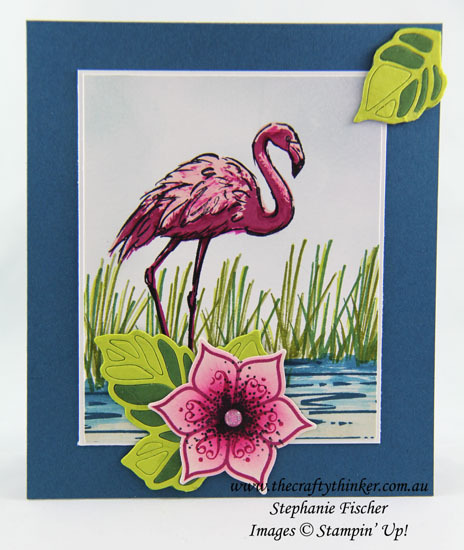 I stamped the three-step flamingo with Powder Pink, Berry Burst and Basic Black inks. Then I dry-brushed a little more Berry Burst ink over the light pink feathers and added a few shadows with more Berry Burst ink. Since I wanted the Flamingo to be in front of the grasses, I protected it with a mask (the only fiddly bit!) before stamping the grass image several times in Lemon Lime Twist, Old Olive and Garden Green inks. I sponged the sky with Soft Sky ink. I stamped the water with Dapper Denim ink and then added some Marina Mist with an Aqua Painter. At this point I realised that I hadn't masked off any of the bird's legs when I stamped it, so it looked like it was walking on water! In order to disguise this flaw, I used a flower left over from a previous card and added some leaves. The flower is made with the Easern Beauty Bundle and has a Glitter Enamel Dot centre. The leaves are cut with the Rose Garden thinlit in both Lemon Lime Twist and Garden Green and paper-pieced together. The base card is Dapper Denim and I added a Whisper White layer to provide a small frame around the image.